The Mystical Mobile Mermaids are Ready to Grant BIG Rewards! 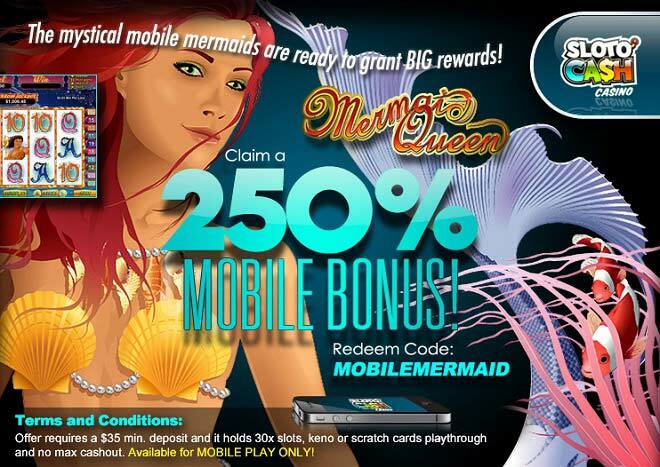 They say that mermaids have co-existed with humans on Earth since the beginning of time – and now it’s your turn to see it for yourself as you help us welcome Mermaid Queen to our mobile gaming selection with a special 250% Mobile bonus! You may or may not be a fan of these popular humanoid aquatic creatures, but one thing’s for sure: hit the spin button of Mermaid Queen to instantly become a fan of this highly-rewarding online slot game! Claim huge rewards when you land the scatter clam as it reveals a pearl and grants you one free spin. Play with even more free spin games when you land the Mermaid Queen icon and collect up to 10 extra free games. Land more clam symbols to claim even more free spins with doubled or even tripled wins if you get to play more than 10 games. Feel like using your mobile device to win more Sloto Cash prizes? Take an aquatic journey to a sea of wins today as you play Mermaid Queen from your iOS, Android or Tablet device with a special 250% bonus!